What better day to appreciate the many ‘faces’ of eggs than on Easter Sunday? To celebrate the occasion, the 11 head chefs of Grand Seasons Hotel Kuala Lumpur have put their heads together to design an interesting hi-tea menu featuring eggs in most of the dishes. The ingredient, so common that most of us cannot live without it, is so versatile in that it blends perfectly into the dishes while offering a diversity of flavours that will make you want to go back for more. “We have prepared close to 100 dishes for the Easter hi-tea at Seasons Cafe, including international and local delights. They are prepared by different chefs who have years of experience under their belts,” said senior sous chef Fabil Md Saman. He said Rabbit Mushroom Ragout Mash Potato Pie and Seasoned Herb Lamb Rack with Veggie and Potato were the must-haves. According to Fabil, the rabbit pie had been well received in the previous years as the meat tasted just like chicken. The lamb with a tender texture that melts in your mouth has been made even better with the aromatic French-inspired sauce. Chinese chef Kendy Lee also has an interesting list of offerings in store. The Braised Duck Breast with Quail Egg is a must-try. Five-spice powder adds a savoury Asian flavour to the dish. 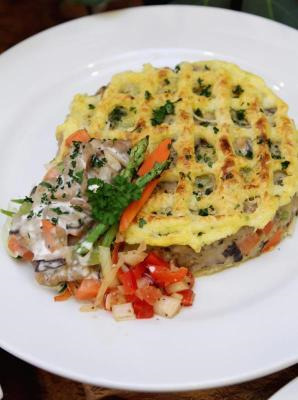 Popular: The Rabbit Mushroom Ragout Mash Potato Pie had been well received in previous years. The duck breast is braised for three hours to ensure that the meat’s full, immense flavour is drawn out. The Steamed Baby Snapper in Asam Nyonya Sauce is another dish to look out for. The addition of century eggs makes this dish even more tasty and it goes well with the tangy and spicy sauce. At the desserts corner, pastry chef Mohd Khairi Mohd Najib has prepared a variety of hot cross buns in different flavours, including mixed fruits, cheese and multi-seed. He recommends the White Chocolate Carrot Cake with Bunny, which he has specially created for Easter. 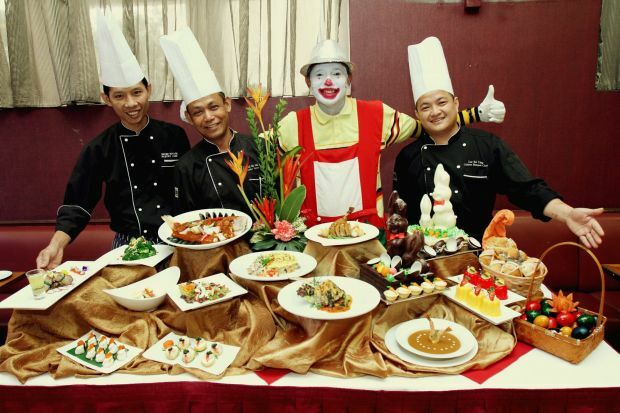 To make your meal experience even more enjoyable, bunnies and Stanley the clown will make a special appearance to entertain the children. There will also be an Easter Egg Hunt and Easter Bunny colouring contest. The Easter Day hi-tea is available on March 31 and priced at RM58++ per adult and RM29++ per child.